R. Buckle, Jacob Epstein: Sculptor, London, 1963, p. 195, no. 297, another cast illustrated. E. Silber, ﻿The Sculpture of Jacob Epstein, Oxford, 1986, p. 159, no. 168, another cast illustrated. Oriel Ross was the daughter of a clergyman from Oxfordshire, who lived as part of Jacob Epstein’s bohemian house, which included wife, mistress, children, models and followers, in Guildford Street, London, for several months in the mid-1920s. Ross was an actress, originally trained at the Royal College of Music. She starred as Isolda in the 1938 television film of Tristan and Isolda, appeared on Broadway in New York, and was a member of the Old Vic Company. She briefly married Earl George Amias Fitzwarrine Poulett 8th, becoming Lady Poulett. Ross was also an amateur artist, sketching various friends and theatrical colleagues such as Elsa Lanchester, and a number of these, including a self-portrait, are now in collection of the National Portrait Gallery. 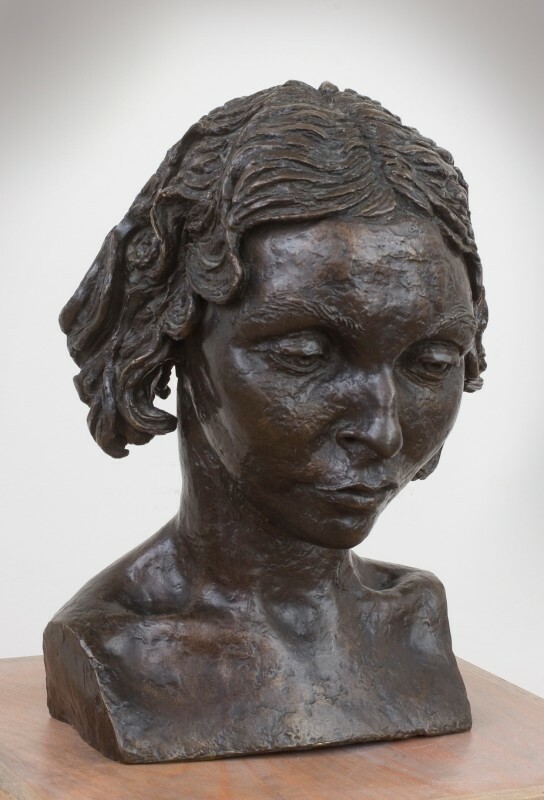 Epstein made three portraits of her, the first a bust in 1925, was exhibited at the Leicester Galleries in 1926, and Epstein’s 1927 New York show. This, the second, was conceived in 1926, and a different cast, now in a private collection, was also in the 1927 New York show. There are two known casts of the Second Portrait of Oriel Ross (bust) – this and one in the collection of the Whitworth Art Gallery, Manchester. The third portrait of Oriel Ross, a torso, was created in 1931/2 and a cast is in the collection of MoMA, New York. Evidently Oriel Ross held a certain fascination for Epstein to return to her three times: he had already sculpted Hollywood actress Elsa Lanchester in 1924 and perhaps the self-awareness of an actress made her a natural modelling subject. It seems likely, however, that her striking facial features were of equal significance in Epstein’s captivation. Her downward gaze accentuates a heart-shaped face, with wide-set eyes under heavy eyebrows, high cheekbones and cupid’s bow lips combining to create a visage of unusual beauty – strikingly handsome, entirely individual and palpably of its time. In Richard Buckle’s authoritative 1963 book on Epstein, he writes that she “has a quizzical expression and was thought to resemble Leondaro’s portrait of Ginovra dei Benci”. The only Leonarda da Vinci in North America in the National Gallery of Washington, the portrait of Ginevra de’ Benci shows a young Florentine noblewoman, a renowned beauty and the subject of many poems in the Medici circle. With her austere aristocratic beauty, it is an arresting comparison. Throughout his career Epstein was drawn to non-Western ideals of beauty – Mexican, Egyptian, Assyrian, Polynesian, and African art variously provided inspiration and he famously had a vast collection of tribal art. Although ostensibly from the quintessential English countryside of Oxfordshire and the daughter of a clergyman, there is something of the exotic, the unusual in Oriel Ross’s face – perhaps features Epstein augmented. Epstein was, and is still, regarded as amongst the most accomplished portraitists of the twentieth-century. Sir John Rothenstein in an obituary for the New York Times called him “by far the greatest portrait sculptor of his time” whilst Eric Newton called his portraits “among the supreme achievements of their kind in the long history of sculptured portraiture”. To create these portraits, Epstein would build up a cast using pellets of clay, indebted to Rodin’s techniques at the start of his career, confident in the looseness with which he handled clay, the spontaneity and expressivity with which he constructed a cast of the sitter. In 1931, a book was published of conversations between Jacob Epstein and Arnold L Heshell: The Sculptor Speaks. In it, Epstein discusses his views of the traditional romantic hierarchy subjugating modelling to carving for its direct handling of the medium. Epstein argues: “modelling…seems to me to be the most genuinely creative. It is the creating something out of nothing. An actual building up and getting to grips with the material…As I see sculpture it must not be rigid. It must quiver with life, while carving often leads a man to neglect the flow and rhythm of life”. Capturing the spirit and character of the sitter comes through the very act of modelling, the creating of texture: “It is the rough surface that gives both character and likeness to the face…the texture is a definite and inseparable part of the whole; it comes from inside so to speak; it grows with the work”. The texture of the surface of this portrait of Oriel Ross is at the heart of its captivating presence. Areas of expressive, bold modelling are visible most particularly in her extraordinary bobbed hair, with thick coils and stylised waves extending outwards rather than falling down from the top of her head, powerfully framing her face. Her forehead and cheeks are gently textured, making her face infinitely tactile, whilst her bust is smooth and polished, drawing attention to her collarbones, and the vertebrae of her spine: astonishingly and touchingly like-like details. Eyes downcast she seems pensive, but assured, youthful yet dignified. Another sitter in the same year, Moysheh Oyved, described the sensation of addressing his portrait by Epstein: “Off me he flayed the shaven skin. And he set me down bleeding, raw, just as I am. He placed before me the mission of my ideal”.